He was born in Leytonstone, London, and after leaving school at 15, worked initially as an insurance clerk. He published his first volume of poetry at the age of 21, in 1903. 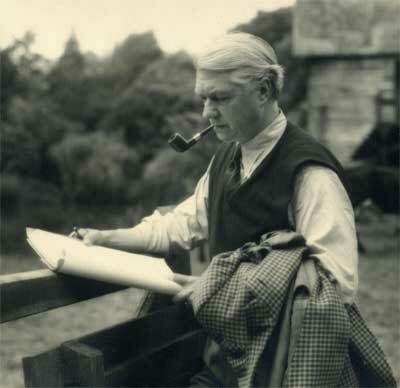 In the period immediately before the First World War, he was one of the group of poets associated with the Gloucestershire village of Dymock, along with Rupert Brooke, Robert Frost and others. In 1918, he scored his first major success with his play, Abraham Lincoln, which caught the mood of the day and even found success in America. He followed it up with other plays in a similar vein, including Mary Stuart and Oliver Cromwell. He progressed into literary criticism, and later became manager of the Birmingham Repertory Theatre. In 1911 he married Kathleen Walpole. He was subsequently married to violinist Daisy Kennedy, ex-wife of Benno Moiseiwitsch (the famous concert pianist). To his great delight a daughter, Penelope, his only child, was born in 1929. He had a great interest in philately in later life, and owned a notable collection. Papers relating to John Drinkwater and collected by his stepdaughter, Tanya Moiseiwitsch, are held at the University of Birmingham Special Collections. He is commemorated in the E11 area by the John Drinkwater Road and John Drinkwater Close. Our names, our ghosts, our immortality."